Businesses are moving towards an ICT (Information and Communications Technology) environment that converges voice, data, video and applications in a single network. Ericsson-LG Enterprise’s iPECS-CM (‘Communication Manager’) provides an easy and flexible solution for today’s unified communications environment, empowering businesses to increase revenues, decrease costs and enhance productivity. 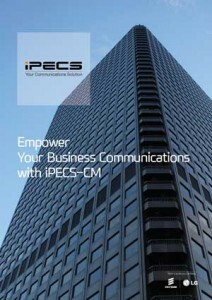 iPECS-CM is an All-IP communications platform providing IP telephony with various multimedia, applications and mobility services for medium and large businesses. It offers the latest in communications technology, delivering a reliable, flexible and secure system for your business. iPECS-CM’s redundant Call Server provides high level survivability against LAN / WAN failure or main office Call Server failure, with redundancy provided by dual processors. This means that the geographic redundancy structure guarantees that communications will remain in operation during the event of a communications failure, even in geographically dispersed environments. The All-IP centralised management platform provides various options to upgrade your current system, from traditional PBX functions to Hot Desk, Mobile Extensions and Cloud computing environments. The platform’s flexible and open standard interface also allows for customisable configurations with any applications, services and end points. The iPECS-CM uses a distributed architecture across an IP network for clear communication without geographic limitations, providing users across multiple locations access to the same features and functions delivered by the central Call Server. iPECS UCS (Unified Communications Software), together with iPECS-CM, combines phones and applications, so that they can run on your PC or mobile phone to provide calls, instant messaging, file sharing for collaboration as well as video conferencing using a single server. iPECS-CM’s flexible features and cost-effective solutions deliver unlimited opportunities and maximise efficiencies for your business. Full and Flexible Scalability: The iPECS-CM’s server-based system works over the IP backbone, offering various modular gateways to provide full scalability from small to large business environments. Maximised Security on IP Communications: iPECS-CM is a proven secure communication solution with encryption, enhanced authentication and access security. Easy Local / Remote Management: JAVA technology applied to Web Management tools allows the same user experience with native applications.